Everything about this recording of the Brahms piano trios sounds modern and up to the minute. The high sound quality distinguishes it from the more venerable offerings of yesteryear with which it shares catalogue space, but so too does the interpretation. These readings are certainly passionate, but they are also impressively disciplined. The excesses of tempo and dynamics that you often meet in recordings of these and Brahms' other chamber works are largely avoided. The result is chamber music that sounds like chamber music: passionate but never monumental or symphonic. To my ear, Brahms works both ways, so this makes a fine complement to the Beaux Arts et al. Rather than save up the passion and intensity for the climaxes, the Eskar Trio instead maintain the level throughout, and manage to do so without exhausting either themselves or the listener. This impression is partly a result of the sound engineering, which gives each of the players a real presence and immediacy. The piano sound is a little generalised, but otherwise the sound is transparent and clear, especially for the violin and cello. But the players also contribute by intensifying the passion of every phrase. You'll find plenty of rapid swells on individual notes, and this tends to be how the phrases are articulated, rather than with tempo changes. These localised dynamic changes are impressively coordinated between the players. The Eskar Trio project a sense of firm control over the music. It does slip once or twice, the finale of the First Trio for example begins to creak at the seams for the sheer quantity of volume. But on the whole these are confident and forthright readings by players who are able to rely on rock-solid technique and deep musical communication within their ensemble. The photograph of the three players on the back of the liner is captioned "Ekar Trio", which I assume to be a typo. I also initially suspected the album's title of containing a fairly major error: "Piano Trios 1-4" – where on Earth have they found a Fourth Piano Trio from Brahms? The answer is that the work, a trio in A major, is of questionable attribution. It was found in a manuscript collection in Bonn in 1924, and has since been linked to Brahms based on its stylistic links with the Op.8 Trio. I'd say it is a bit presumptuous to describe it as "Brahms Piano Trio No.4" on those grounds, although that is certainly more inciting than "Piano Trio No.0". Whatever its history, the piece is well worth hearing, so this is as good a place to record it as any. I'm almost inclined to say that the strongest evidence against it not being by Brahms is that is just sounds too much like Brahms. It presumably dates back to a time when Brahms was not yet famous enough to have imitators. Even so, it sits stylistically somewhere between Schumann and Brahms, without the psychological complexity of the former or the technical sophistication of the latter, even in his youngest days. The resulting clarity of texture makes it the ideal work for the Eskar Trio. The way they always seem to be trying to clarify Brahms' complex textures in his mature work to create big, intense sounds – this piece, with its clear, bold harmonies and easily articulated dramatic structure does half of that job for them. 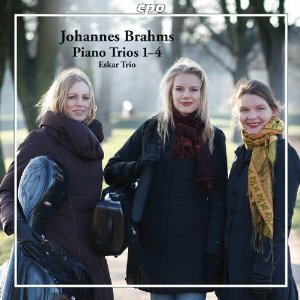 This release isn't the last word when it comes to Brahms' Piano Trios, but it is a welcome addition to the catalogue. The Eskar Trio are able to make a big impact with every phrase, yet without resorting to interpretive excesses. And the clarity of playing is matched by the clarity of the sound recording. If they have a friend who plays viola, I'd love to hear what they could do with the Quartets.